South Beach Florida is the ideal destination to organize a wedding ceremony. Wedding in south beach can be accomplished in many different ways, either by hiring a wedding planner to take care of the ceremony or by organizing it yourself. Miami wedding planners are extremely well organized and very professional in Miami, they will take care of the outmost little details of your ceremony. 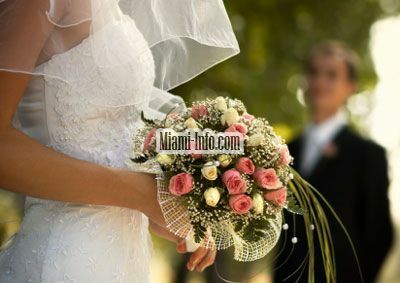 If you think to come to Miami to get married you might need accommodations for you, your family and your guests. We recommend you hotels in the South Beach, Motels or vacation rental apartments where you can feel comfortable to plan your perfect wedding. Should you decide to save the money; south beach and Miami offer a wealth of resources that will allow you to have all of its aspects fixed painlessly. Miami being a large city it offers its advantages. You will be able to choose amongst a large numbers of vendors from wedding photographers, wedding videographers, wedding florists, caterers etc. All aspects of your wedding in South Beach, Florida will be taken care of, from the religious ceremony, to the wedding reception or even the bridal shower. Low budget wedding or upscale wedding will be successful. Great south beach and miami weather throughout the year will increase likelihood of a great ceremony. Reception sites are numerous and of high standards, we suggest the following: The Lowes, the Fontainbleau, the Mandarin hotel. To accommodate your guests lodging needs we suggest the following hotels: The Tides, The National, The Marriot. You could also rent a Miami Vacation Home or a South Beach Florida Vacation Condo. Of course people in need of originality could always organize their parties or reception on a vessel or on a party boat.